For almost 90 years, Zurich Engineering has been helping businesses identify, manage and control risk. As part of Zurich, a leading commercial insurer in the UK, the division’s 500 engineer surveyors perform upwards of 3.5 million safety inspections a year on items ranging from escalators, elevators and industrial machinery to kettles and computers. Zurich Engineering plays a vital role in ensuring that its customers protect their employees, the public and their businesses; therefore, Zurich takes no risks when it comes to choosing a mobile computer for its surveyors. This is a tough market and one where the larger players face increased competition from small, independent contractors. 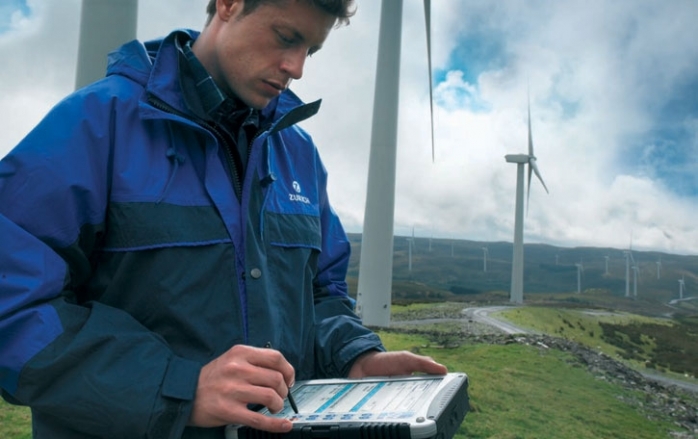 Luckily, Zurich can always rely on one strength—the quality of its service—and its Panasonic Toughbook® mobile computers play a major role in helping it deliver just that. convertible laptop is built to survive. Its magnesium alloy casing and shock-resistant hard drives shrug off 6-foot drops*, while the IP65-rated** sealed construction leaves no opportunity for dust, rain or water to take their toll. One of Zurich’s Panasonic Toughbooks, was run over by a crane, sustained a cracked screen but its hard disk was still intact. “We just took the hard drive, put it in a new notebook, and the guy was up and running,” claims McMullen. That’s not to say there has never been pressure to change devices. “We have had other manufacturers try to sell us on their solutions, but no one has been able to show us a device that provides the mix of performance, reliability and value of the Toughbook brand,” McMullen adds. Customization has always been a strength of the Toughbook brand, and Zurich Engineering is taking full advantage of the camera built in to its Toughbook 19. As McMullen says, “Now if there is a fault on a piece of equipment, I can easily send the customer a photo.” With the new devices, photos can be taken and combined with the report almost instantaneously. There’s no need to explain the size of a crack or other defect—the customer can see for him- or herself. “This is groundbreaking for our industry,” says McMullen, “and nobody else is doing this.” What’s more, there are side benefits. Surveyors can photograph equipment immediately after inspection, and if it’s dismantled and reassembled incorrectly at a later date, the team has the evidence to prove it.